Burney sophomore Kaitlyn Estes beats the throw to Trinity senior second baseman Lydia Harris. The action happened in the first game of a doubleheader at the Raider diamond Friday and won by Burney, 20-10, in six innings. Burney senior Ashley Davies (19) avoids the tag at home plate as she safely slides beyond the reach of Trinity senior catcher Trinity Pellegrini. The action happened in the first game of a doubleheader at the Raider diamond Friday and won by Burney, 20-10, in six innings. Trinity’s Christian Bemis rounds the turn during a relay event Thursday. 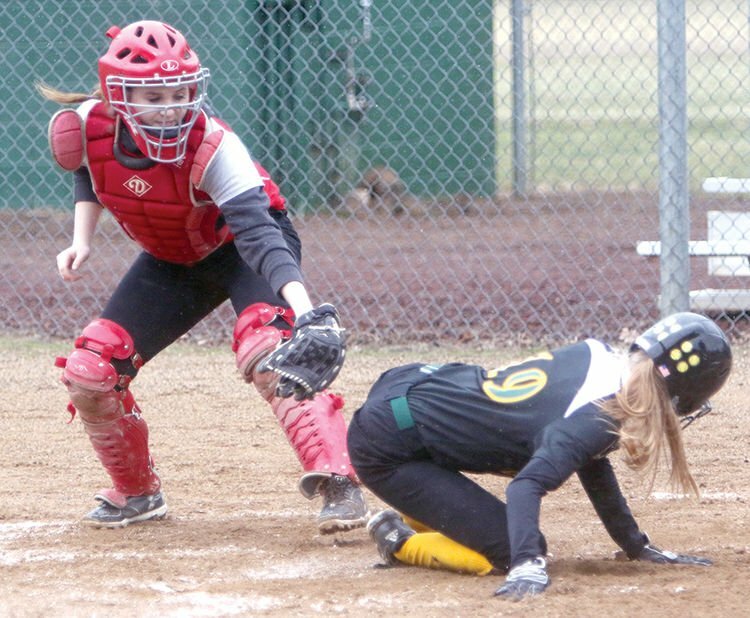 The Lady Wolves (0-8) dropped a doubleheader to the Burney Raiders on Friday, March 22, in cold, wet and miserable conditions. In game one, Trinity’s bats finally came alive as the Lady Wolves posted their first double-digit scoring effort of the season. But it was not enough to hold off Burney as Trinity fell 20-10. Trinity Pellegrini led the way going 3-for-4, with a double and a triple, four RBIs, a run scored and a stolen base. Brooklyn Manning also went 3-for-4, including two triples, with two RBIs and three runs scored. Kelsey MacLaren was 1-for-4 with an RBI and two runs scored. Keirsten McNeely, Lydia Harris and Ally Case each contributed a hit. Case took the loss, allowing only three earned runs while striking out three. In game two, Trinity was silenced early as Burney jumped out to a 10-1 lead after three innings. 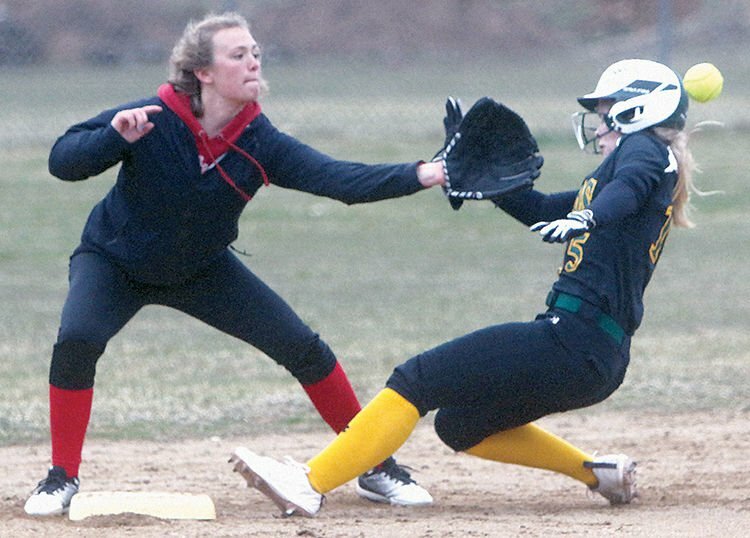 However, the Lady Wolves would score two runs in the fourth and fifth innings to close the gap before the Raiders put it away with a six-run sixth. Case led the way at the plate, going 2-for-3 with a double and home run, two RBIs and two runs scored. Harris and McNeely each added RBIs. Case took the loss, allowing only six hits and four earned runs. The Wolves (3-5) opened their ACA Tournament play at Big League Dreams, Redding, with a 10-0 no-hit victory over Happy Camp Thursday afternoon, March 21. Trinity’s Brad MacLaren tossed the no-hitter, missing a perfect game by one hit-batsman. MacLaren struck out 10 in the five-inning game. Trinity would score two runs in the second inning, two in the third and sixth in the fifth. Matthew Miyamoto, Isaac Ross, Colton Still (a double), Jacob Hauser and Ryan DeMoss each had hits for the Wolves, with Still and Hauser each picking up two RBIs while Dylan Miller and Ross each added one. Trinity also ran wild on the basepaths, stealing eight bases without being caught. Miyamoto, Still and John Marshall each had two, while Jack Miller and Ross each added one. Later that evening the Wolves fell to Ameri­can Christian Academy (Anderson) 12-6. On Friday Trinity dropped a 12-2 decision to Mercy (Red Bluff). The Warriors did the bulk of the damage in the first two innings, scoring six in the first and five in the second to take an 11-1 lead. Trinity score single runs in the first and third innings. On Saturday Trinity fell 5-0 to Weed. Concluding last week’s reporting, after losses to Clear Lake and Esparto on Friday, March 15, at the Fort Bragg Tournament, the Wolves rallied to score a 16-6 victory over Hoopa Valley on Saturday, March 16. Marshall had two hits, both doubles, while Still, Julia Norman and DeMoss each doubled. Daniel Harrison and Oogie Williamson each had a single. Marshall had three RBIs, Still two, Norman and DeMoss one. Harrison scored three times for the Wolves, while Miyamoto, Miller and Norman scored twice. The Wolves racked up 15 stolen bases, with Harrison leading the way with four. James Saulsbery went the distance for the win, allowing only one earned run while striking out four. The Wolfpack returns to practice this week after a busy week of meets. The Eagle Classic Relays was rescheduled to last Thursday due to extreme weather, and this created a reduced boys’ squad (and no girls’ teams) attending from Trinity. Trinity was the sole boys Division 3 team yet was able to place fifth overall for varsity boys and seventh for frosh/soph boys. Standout performances included: 4x110 shuttle hurdle relay winners Alex McIntosh, Ari Gaeuman, Yi-Chen Pan and Christian Bemis in a time of 1:18.21; third place varsity 4x200 relay team of Christian Bemis, Jadyn Wilson, Levi Hubbard and Scott Rupp in 2:03.96; third place varsity 4x400 relay team of Yi-Chen Pan, Ari Gaueman, Jadyn Wilson and Scott Rupp in 3:54.27; third place varsity sprint medley relay team of Ari Gaeuman, Shawn Scribner, Levi Hubbard and Scott Rupp in 1:44.27. The varsity shot put relay team was led by Jack Van Dine’s throw of 40’3” (and Fritz McIntosh’s PR throw of 35’11.5” and sophomore Jasper Hedrick-Moore’s PR 31’8.5”). Additionally, Shawn Scribner outright won the long jump with a mark of 21’7”, a PR very early in the season for this level of competitiveness. This meet was followed by the Burt Williams Classic at Central Valley High School on a stormy Saturday. Among the 26 teams, Trinity’s boys F/S placed first, boys varsity placed second, and girls varsity placed 4th, just 1 point behind third (with only two, very strong, competitors, Lauren Harper and sophomore Julia Norman). Of particular note, senior Shawn Scribner scored 30 points in just three events and senior Lauren Harper scored 40 points in four events. Top boys marks included: Scribner, first place varsity 100 meters in 11.69, Scott Rupp second places in both F/S 100 meters (12.43, PR) and 200 meters (25.62, PR), Holden Navarro second in F/S 1600 meters (4:56, PR) and third in 3200 meters (11:21, PR), Alex McIntosh fourth in F/S 110 hurdles (20.18, PR), Christian Bemis third in varsity 110 hurdles (19.59. PR), Ari Gaeuman second in varsity 300 hurdles (47.64, PR), second place F/S 4x100 relay team of Levi Hubbard, Joshua Goodman, Jasper Hedrick-Moore, Scott Rupp (52.59), second place varsity 4x400 relay team of Ari Gaeuman, Kevin Martin, Jadyn Wilson, Scott Rupp (4:00.8), second place F/S relay team of Rief Ehlerding, Holden Navarro, ChangZong Lee, Joshua Goodman (5:09.4), Jasper Hedrick-Moore second in F/S shot put (34’07”, PR), Jack Van Dine first in varsity shot put (40’1.5”) and second in varsity discus (116’03”), Alex McIntosh second in F/S pole vault (8’0”, PR), Shawn Scribner first in Varsity Long Jump (21’-3.75”) and first in varsity triple jump (41’-1”). Top girls marks included Lauren Harper first place varsity 100 meters in 13.06 (PR), second place varsity 200 meters in 26.92, first place varsity 400 meters in 59.15 and first place varsity 3200 meters (12:42.33), Julia Norman second in varsity 400 meters (65.47, PR), Josephine Brookins fifth place F/S high jump (4’0”, PR), and third place F/S 4x100 relay team of Dagan Fox, Josephine Brookins, Claire Brennan and Julia Norman (1:05.55). The Wolfpack track team is headed to Enterprise High School this Saturday for the Hornet Invitational, a Northern Section 20-team competition. Highlight events will include Scribner facing the other top sprinters and jumpers in our section, Trinity’s relay teams shaking up the mix of top schools, and new hurdlers as well as veteran newly strengthened throwers bringing their best to this competition. The meet starts at 9:30 a.m.
Harper will be competing in the Stanford Invitation on Saturday, racing in the invitational 400-meter and 800-meter events, alongside fellow top varsity high school racers in California. The Wolves fielded a short squad Thursday, March 21, at Lake Shastina Golf Course. Lorin Blanchard led the way, shooting 52 on the front nine and a 57 on the back nine for an 18-hole score of 109. Tesla Ehlerding shot 69-72 for a 141 total score, while Josh Pope shot 68-80 for a 148. No games scheduled. The Lady Jacks (0-4) are scheduled to visit Weaverville for a doubleheader with Trinity High School starting at 2 p.m. Friday, March 29, weather permitting. This is a reschedule from the original Thursday, March 28, date. March 27: Hayfork track at SVL-Arbuckle, 3:30 p.m.
March 29: Trinity softball vs. Hayfork (2), 2 p.m.
April 1: Hayfork softball vs. Greenville* (2), 2 p.m.
April 2: Trinity softball at Weed* (2), 2 p.m.
April 2: Trinity baseball at Weed* (2), 2 p.m.
April 3: Hayfork track at MTVL Corning, 3:30 p.m.
April 4: Hayfork softball at Big Valley* (Beiber) (2), 2 p.m.
April 4: Trinity softball vs. St. Bernard’s (2), 2 p.m.